Takeaway: Asking the right questions and using the right forms can ensure that you collect high-quality data when performing risk assessments. When it comes to performing safety inspections, it’s important that the information collected is accurate. When the formulations of the questions are dependent on a technician’s interpretation of the situation, inconsistencies can arise, compromising the quality of the data and the safety of the technicians who rely on it to correctly evaluate the situation. Collecting objective data is crucial when it comes to performing risk assessments, but there are only so many hours in a day. Paper forms, and the time it takes between submitting and processing them, are an inefficient and ineffective way of dealing with existing dangers in the field. For example, scaffolding that looks unsteady today might fall before anyone is dispatched to adjust it because the paperwork is still sitting on the safety manager’s desk waiting to be processed. Another issue with risk assessments is that inspections are often based on a technician’s own evaluation of a situation, but depending on training, perspective, or even how busy they are, that evaluation can change wildly. What looks “safe enough” to one inspector might be marked an unacceptable risk by another. This does not make for good data, nor a safe environment. Rather than allowing users to sign off on a potentially unsafe situation to save time, assessments should tell the user exactly what is the worst that could happen and the best way to prevent it, all in real time. One example of this is fall protection on a construction site. If the assessment is a series of check boxes that ask, “Is this safe? Yes or no,” the actual risk is not recorded—the technician’s opinion is. Instead, a well-designed form should ask leading questions. If our field team is working without protection, a leading question might be "How high is the fall?” If the inspector notes that the fall is less than one foot high, a smart mobile form would inform them that the risk is low. If, however, the free-fall distance is listed at twenty-five feet, the mobile form should notify the inspector right on the screen that the risks of injury are high and then suggest equipment required to make the task safe. 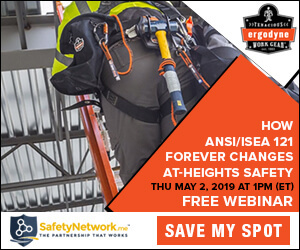 The software's internal logic should recognize the severity of the risk from the user’s answers and trigger additional actions, like ordering safety harnesses be delivered to the site or notifying the safety manager that a railing is needed for a scaffold. Risk assessments should collect objective field data and assess the situation for the person in the field. Inspectors need to be told “This is a risk” directly in the form, based on the questions asked. Whether your technician isn’t paying attention because they’re busy, tired, or it’s just one of those days, the questions on a risk assessment form should allow them to collect high-quality data, regardless of their level of awareness, and act on that data immediately. If you want to learn more about how digital forms running on iPhone and iPad can make your job safer, we invite you to register for the webinar “Your Path to a Safer Jobsite: How Mobility Can Transform Your EHS Program." What is the most valuable part of a mobile solution? How can employers protect their long-haul truck drivers? What is the best way to ensure a safe workplace? What is the biggest shift in companies’ approaches to safety this year? What's the biggest safety trend coming in 2017? What are the most commonly used safety forms in 2016? What are the most common ways to measure safety on job sites? What do EHS professionals feel is the likelihood that their organizations will reach Target Zero for safety incidents within the next year? Which EHS performance standards are adhered to most commonly? What is the most common way site supervisors are made aware of safety issues?